Need a quick dinner idea? In just 30 minutes you can have this Creamy Sausage and Potatoes on the table! It’s the perfect easy dinner and one of our favorite sausage and potatoes recipes. This is a sponsored post written by me on behalf of Shady Brook Farms. All opinions are my own. Simple, quick dinners are one of my favorite things ever! I’m all about finding ways to get a satisfying meal on the table without needing to spend hours in the kitchen, especially with school starting again and trying to get back into a more scheduled routine. Because as much as I love being in the kitchen, I’d much rather spend that time hanging out with my family when they’re around, you know? 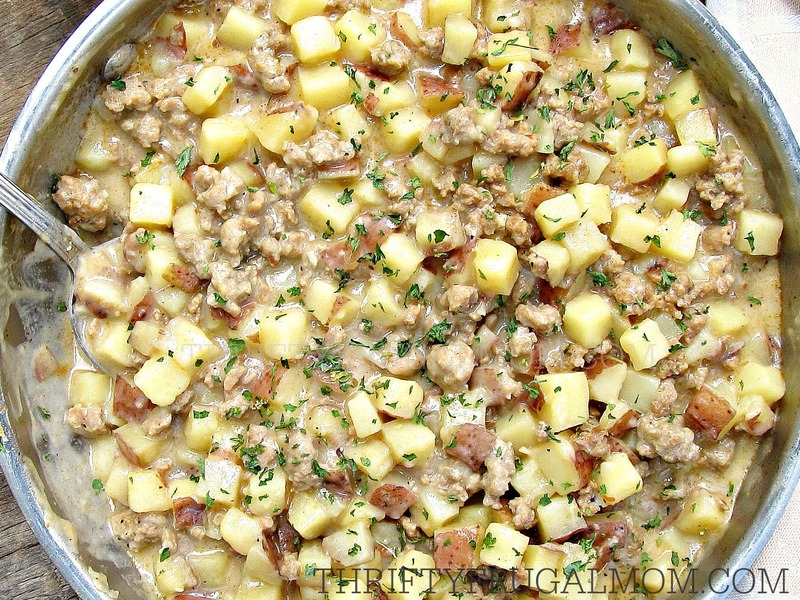 I was trying to figure out what to make for dinner recently and remembered this Creamy Sausage and Potatoes dish that my mom used to make when I was a girl. I was a super picky eater (yup, unfortunately, it’s true! ), but this was one dish I was always happy to see sitting on the table when we gathered for dinner. Little did I know that one of the reasons my mom made it so often was because it’s easy to make and inexpensive too! The thing that takes this dish from “just okay” to “wow” is good quality, seasoned sausage. Because the rest of the dish is pretty basic, the sausage really makes all the difference. It’s flavor will permeate each bite, so it’s worth choosing a good brand for this sausage and potatoes recipe. 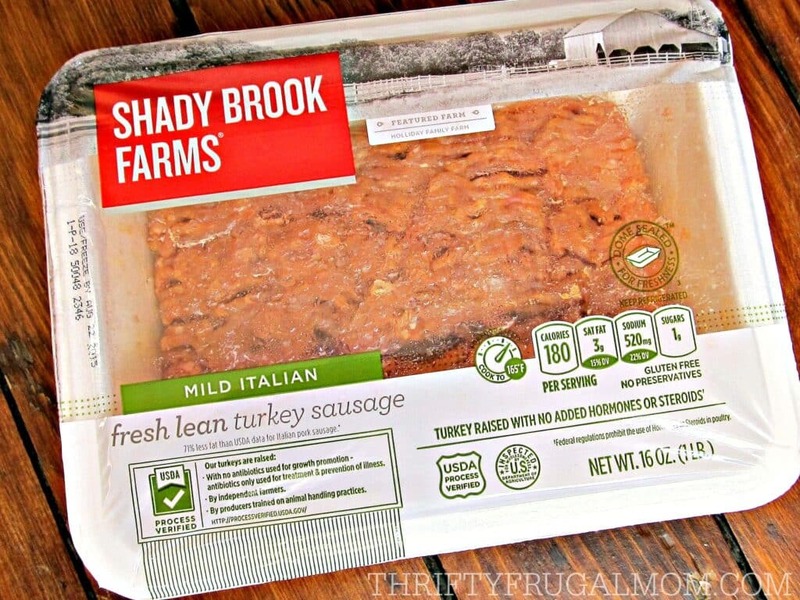 When I make it, I love using Shady Brook Farm’s Mild Italian Turkey Sausage- it tastes just like what I remember my mom making! And the great thing about turkey is that it’s a lean, healthier substitute for traditional pork sausage. I also love that Shady Brook Farms works with more than 700 independent farmers who raise their turkeys without growth-promoting antibiotics! I don’t know about you, but I’m all for avoiding hormones in my food as much as possible! 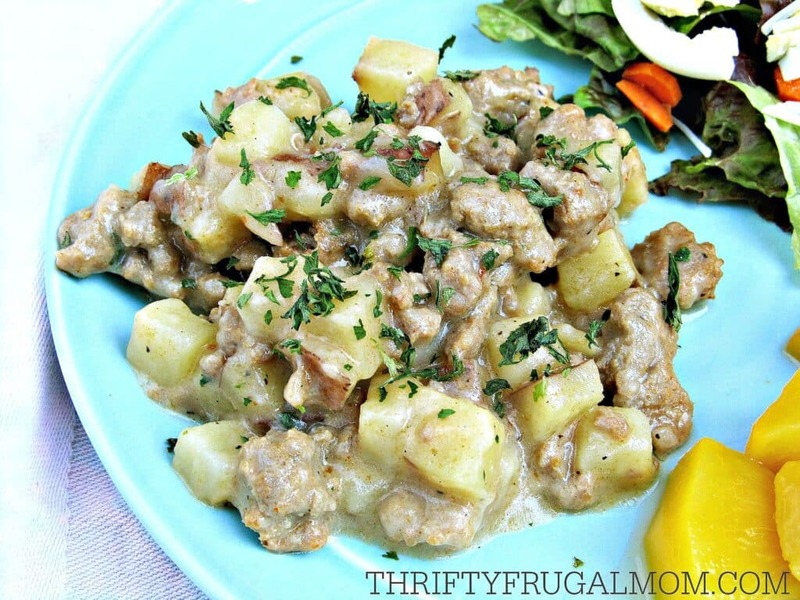 I kind of knew my family would like this Creamy Sausage and Potatoes, but it still made my day when I was met with these comments: “Mom, this is really good!” (from our pickiest eater) and “You need to make this again!” and “Wow, this is very tasty, Babe!” Our 18 mo. old gave her own approval by eating thirds. And me? Well, I thoroughly enjoyed every bite. But what made it even better was the fact that it took me just a tad over 30 minutes, start to finish, to get this dinner on the table. Now that, my friends, is a true winner! Fry sausage and onion until browned. Add enough water to cover sausage, then cook 10 minutes. Add potatoes, salt and pepper to meat. Cover and cook until potatoes are tender, about 10 minutes. While potatoes are cooking, whisk milk and flour together until smooth. Add to sausage and potato mixture and cook just until thickened, stirring occasionally. I, too, am a turkey sausage fan. I use it with everything: pasta, pizza/calzone, empanadas, and so much more. It's so much lighter and tastier, to me, than pork sausage. This meal is new to me, never had it with potatoes, so I will have to try it. Thanks! Well, you just gave me some great new ideas for using sausage too! And I think you'll enjoy pairing it with potatoes. It's so simple, but so good! Ah, so glad you enjoy the recipes! And hey, you might as well use the sausage you have, right? Our family doesn't eat beef, pork, or seafood by choice, so turkey and chicken are always on the menu. It can be challenging to come up with fresh meal ideas when products are limited- especially on a budget. I'm always looking for new, inexpensive ways to feed my family of seven (it's how I found your site! ), and this recipe looks like a winner! I'd love to give this new product a try! I can believe that it's challenging to find new meal ideas- I find it hard enough and we eat other meats! I bet you go through lots of food with a family of 7! Hi ! I enjoy your website. This recipe will surely be delicious. We love turkey sausage. Good texture and flavor. Thanks, Robin! Glad to hear it. And fun to meet another turkey sausage fan! I think my family would enjoy these products. Thanks! Awesome! And you are entered into the giveaway. Throw togethers- I like that! And yes, my family loves them too. Three guys? I bet you go through lots of food! This looks like a great meal to make now that the new school year is upon us. Looking forward to trying this! Yes, it's perfect for a quick school night dinner! Recipe sounds delicious! We can't wait to enjoy this! Looks like a great, easy recipe for "real" food; thanks for sharing! Thanks, Hilary! I'm all for simple recipes that use basic ingredients! Wow, looks great! My family would definitely eat that. Of course I would love to enter the give away contest. My mister loves anything turkey so it would be fun to surprise him with something from Shady Brook Farms. Your picky eater story reminds me of an anecdote from my childhood. While not a picky eater, the first time my mom served that old classic tuna noodle casserole (which I guess she hadn't made in a long time at that point) I thought it was FAN-TASTIC. I was like, why aren't we eating this every day? Ha ha, can you imagine? I wish someone would say that to me about something easy like that. Tuna Noodle Casserole, huh? Well, you really aren't hard to please now, are you? :P Oh and my man loves turkey too- in fact, he prefers it over chicken! We love turkey sausage and would love to win the prize!! This recipe reminds me of a similar one that I forgot about. I will have to try this one. And I have never used turkey sausage so I will have to try that, too. I, too, am looking for ways to make healthier meals and also don't like to spend lots of time cooking. Ah, I wonder how your similar recipe is different? Obviously you can use regular pork sausage for this too, but the turkey sausage is often a bit healthier. And yup, healthy quick meas are awesome! The recipe sounds delicious and easy. I would love to try the turkey sausage. We love SIMPLE delicious recipes around these north woods! :-) Thanks for the recipe, Lydia, and giveaway opportunity! You're welcome! And I bet your area will be absolutely breathtaking just soon, won't it? Well, now, that's an invitation! :) We keep trying to decide what to do next year for our 10th....maybe we should consider Maine! I would like to try the recipe and the sausage! We would definitely love to try this meat, as well as the recipe you shared! Thanks for the giveaway! Sure thing! Thanks for entering! This looks good! Hoping to win? Way to be creative! Was it good? Or was it a bit bland? I just am curious because the sausage is a lot of what gives this dish flavor. Ah, so smart to cook once, eat twice. And I love your idea for using up the other half of the turkey sausage. Very creative! *patting your back too* ;) Thanks for the suggestion of subbing Italian turkey sausage instead of burger. I can totally believe it would be amazing! Will have to try it. Also, appreciate your comment about the coupon. Will do. This looks delicious, Lydia! It is a hearty meal that everyone in my family would like. I love how quick and easy it comes together! I'm going to have to make this soon! Pinning. It's definitely one of those comfort food sort of dishes for the whole family! This looks like a great dinner that hubby would love! This looks absolutely amazing. As a working mom, this helps me spend more time with my family in the evenings and not be in the kitchen all night. Thank you! Yes, I like the occasional time consuming dish because I do enjoy cooking. But most of the time, I'd much rather spend time with my family! I think you all will like it, Krista! I wonder if this would work with a smoked sausage instead of ground sausage? I very rarely buy sausage but I may pick up some turkey from Aldi if it'll make the recipe better. I think smoked sausage would probably work too, as long as you remove the casing. (I assume you are talking about sausage links, right?) Part of what makes the Italian sausage so good with this is the somewhat spicy seasoning. But you could probably also get that by adding a bit of black pepper to the recipe. If you try it, I'd love to know how it works! Aw, thanks for letting me know, Denise! I'm honored that it made it to the permanent recipe card file. ;) Hope you all can enjoy it for years to come! How do you think this would be as a make-a-head? or a crockpot dish? Not sure exactly what you mean when you say make-ahead, but you can definitely make this and then reheat it. I do that with the leftovers all the time! I've never tried making it and freezing it, but I think it would probably work- you'd just want to let it thaw completely and then heat up. I have never tried adapting this for a crock-pot, but I'm guessing it could work, although I'm not sure what adjustments would need to be made. If you try it, I'd love to know how it works!